Private transfer to Reykjavik. Overnight stay in a superior hotel in Iceland’s capital. Included choice of activities: Horseback riding or whale watching or Blue Lagoon or extra sightseeing, depending on arrival time or departure time. After leaving Reykjavík, we explore Hraunfossar, a series of waterfalls pouring from beneath a long row of lava fields into Hvítá River. Barnafoss “the Children’s waterfall” is nearby and has its own tragic tale. Then we visit Europe’s most powerful hot spring and climb the Grábrók volcano crater in West Iceland. We get an insight to Iceland’s past at Glaumbær turf farm & folk museum. We continue along fjords and over mountains to Akureyri – the capital of North Iceland, our base for the next five nights. In the morning, you have a guided walk through Akureyri, which has a charming city center and a fine botanical garden. The afternoon we travel by car and ferry to Hrísey Island, located in the middle of Iceland’s longest fjord and home to thousands of seabirds. This day excursion includes some walking/hiking. Included choice of activities: Whale watching & sea angling in Eyjafjordur fjord or horseback riding. We explore Goðafoss, the waterfall of the Gods, and continue to Lake Mývatn, known for its rich bird life and extraordinary volcanic lava landscapes. Visit pseudo craters, walk in the lava field Dimmuborgir, climb up to the rim of the ash crater Hverfjall, see the hot springs and bubbling mud pools of Námaskarð, and travel to Víti crater lake in the Krafla geothermal fields. This day excursion includes some walking/hiking. 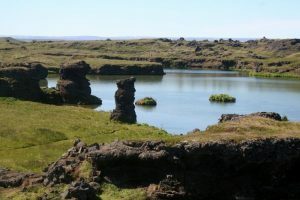 Included choice of activities: Bird museum or mountain biking or Mývatn Nature Baths. Today we see spectacular fjord landscapes while travelling to Siglufjörður, Iceland’s northernmost town and known as the herring capital of the North Atlantic. Siglufjörður is located on the mountainous Tröllaskagi Peninsula. On the way, we pass small fishing villages and stop at a deserted valley that even most Icelanders have not seen. Near to Siglufjörður is Hofsós, a small and friendly village on the eastern shores of the Skagafjörður bay. Its natural harbour makes it one of the oldest trading ports in Iceland dating back to the 16th century. The Icelandic Emigration Centre focuses on the mass emigration from Iceland to North America in the late 19th century and is interesting to locals and visitors alike. If you feel like swimming in one of Iceland’s most beautiful outdoor geothermal swimming pools, Hofsós is the place. The view is superb! Included choice of activities: Hofsós geothermal swimming pool or a visit to small local turf church or visit to cultural site Holar. Húsavík is a picturesque small fishing town only an hour from Akureyri, where you join a whale watching cruise and visit the whale museum. We continue to the northern part of the Vatnajökull National Park, stop at bird cliffs where puffins may be seen, and visit the huge canyon of Ásbyrgi and Dettifoss, Europe’s most powerful waterfall. This day excursion includes some walking/hiking. We go through the heart of Iceland today – travelling on the Kjölur Trail, between the glaciers Langjökull and Hofsjökull. We stop at the hot springs of Hveravellir, where you can soak in a natural hot pool. This region is shrouded in mystery, with folktales of ghosts, giants and outlaws. You experience one of Europe’s last wildernesses! Short stop at Gullfoss waterfall and Geysir hot springs before returning for the last overnight in Reykjavík. Private transfer from your accommodation in Reykjavík to Keflavík airport.